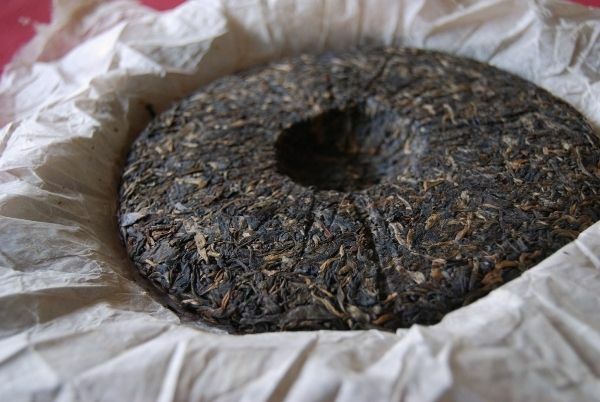 The Half-Dipper: 2003 6FTM "Fengqing Lushi"
I don't drink a lot of 6FTM, it mostly being bargain-basement filler. Some of their older cakes, though, can be really very proper. This is one of them - thanks to Keng for generously sending us an entire cake. I love wrappers from the charmingly naive era before it they became designed in Photoshop - they're so lo-fi and "real". Unusually for such a brand, this cake has its provenance clearly stated: Majie village, near Lushi town, in Fengqing county, which makes this a Lincang [lin-tsang] cake. The wrapper also indicates that its production was limited (!) to 2000 kg; i.e., exactly 800 tong. I drink this at 5 a.m. The sun is up already, and the birds' dawn chorus is deafening. The warm air and birdsong gives our chilly old country a distinctly tropical feeling, this morning. 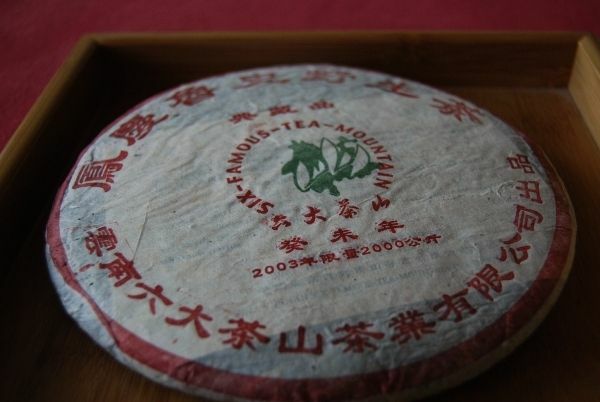 Powerful, woody, and malty, this tea bites back and has some character. The woodiness is particularly sharp, as if arrived at naturally from a state of original bitterness. Tons of caffeine from this cake leave me wide-eyed and ready for the day. Let it be remembered that 6FTM can (or at least could) make very decent cakes. 2002 6FTM "Bainian Qiaomu Zhangxiang"
2009 Zhimingdu "Bada", "Mengsong", "Bulang"
2008 Guyi - Yubang "Yiwu Zhengshan"
1999 Changtai - Yichanghao "Yiwu"
2004 Guyi - Yubang "Gushu"
2004 Yangpinhao "Yibang Bainian Gushu"
2009 Yunzhiyuan / Ruicaoxiang "Ailao Juse"
2003 Yiwu Manluo - Changdahao "Yiwu Zhengshan"
2003 Menghai - Dayi "Yiwu Zhengshan"
2004 Changtai - Jifengyuan "Banna"